17th January 2019 - Tranquil trailblazer: Flipflopi dhow to take its plastic revolution on Indian Ocean tour. 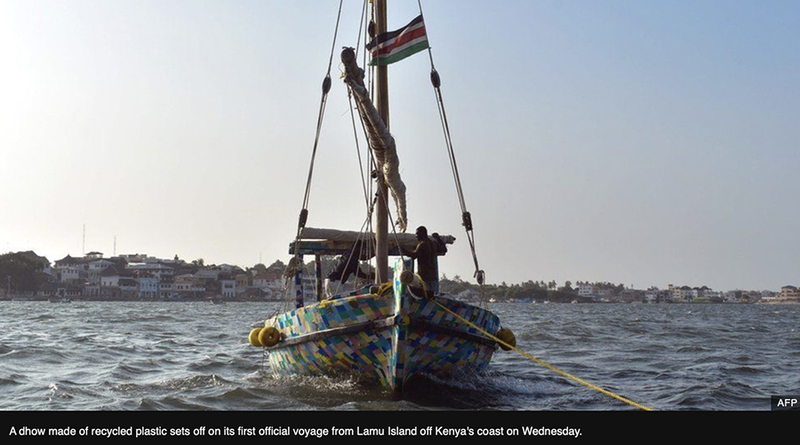 12th January 2019 - The first recycled plastic boat and its maiden voyage from Lamu to Zanzibar. December 2018 - Our boat builder Ali Skanda’s effort has been recognised by being identified as a kenyan hero. October 2018 - Kenyan volunteers taking the matter of plastic pollution into their own hands. 16th September 2018 - Film about the Flipflopi launch on the World Cleanup Day. 15th September 2018 - The Flipflopi prototype sailed for the first time in the waters off Kenya’s Lamu island. 15th September 2018 - Kenya’s leading TV station has been following the Flipflopi from the very beginning. 5th June 2018 - How boats from recycled plastic help people, animals and nature in Lamu. Article written by Ben Morison for the British Airways In-Flight Magazine which is brilliant. Plastikmüll ist weltweit ein Problem. Einige Staaten ergreifen harte Maßnahmen im Kampf gegen die Umweltverschmutzung - in Kenia drohen sogar Haftstrafen, wenn jemand eine Plastiktüte nutzt. 11th Nov 2017 – amazing coverage on the BBC website globally. The 1 minute clip was headline article on BBC News, and BBC Africa sections for a full weekend ensuring our story and key messages were viewed by millions of people worldwide. 12th Nov 2017 – Film and article by Al Jazeera journalist Catherine Soi who visited us in Kenya to learn more about the process we’ve developed to turn ocean plastics into our revolutionary sailing boat. 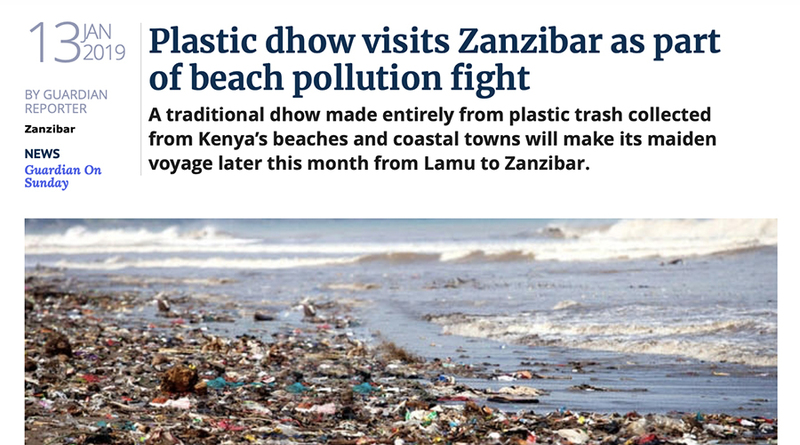 6th Nov 2017 – this 4 minute segment broadcast nationally in France exposed the plastics problems faced in Kenya and on The Flipflopi Projects work to address them. A dhow made from plastic? 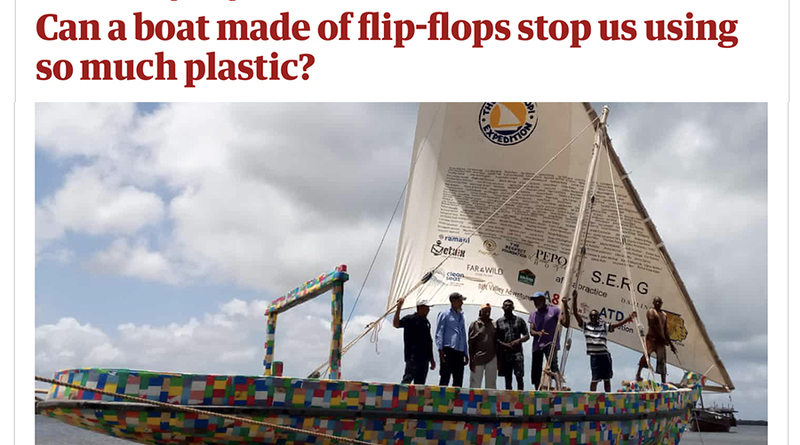 A pioneering crew of environmental activists are putting their best foot forward with the flipflopi dhow, a vessel made entirely of recycled plastic - including a whole lot of flip flops - which they will sail 5,000km from Lamu Island off Kenya to Cape Town. This article by the excellent Sara Royle in the Westmorland Gazette, a regional newspaper in the UK, previews the Flipflopi Exhibition at The Hub in Sedbergh. From the Daily Nation - one of Kenya's leading daily newspapers. 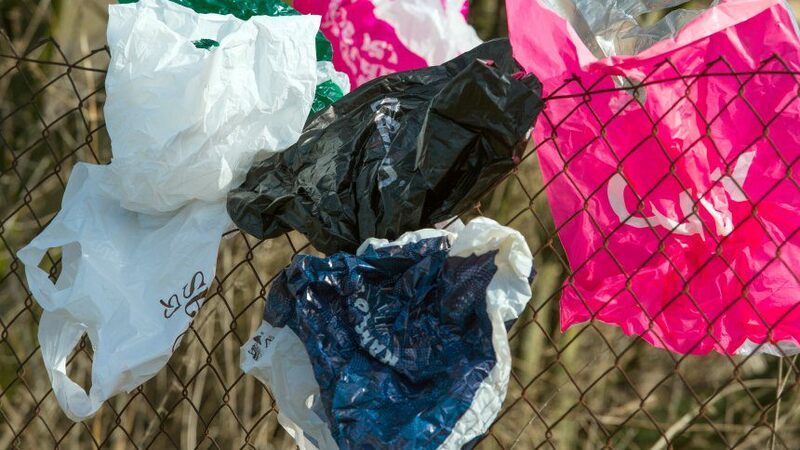 In June 2017 we were invited to attend a Kenya government organised 'Stakeholders forum' on the implementation of the impending plastic bag ban. Here Citizen TV interview Flipflopi team member Sam Ngaruiya. A one of a kind dhow in the world is set to make its maiden trip from Lamu to Cape Town, a journey of 5,250km, in January next year. 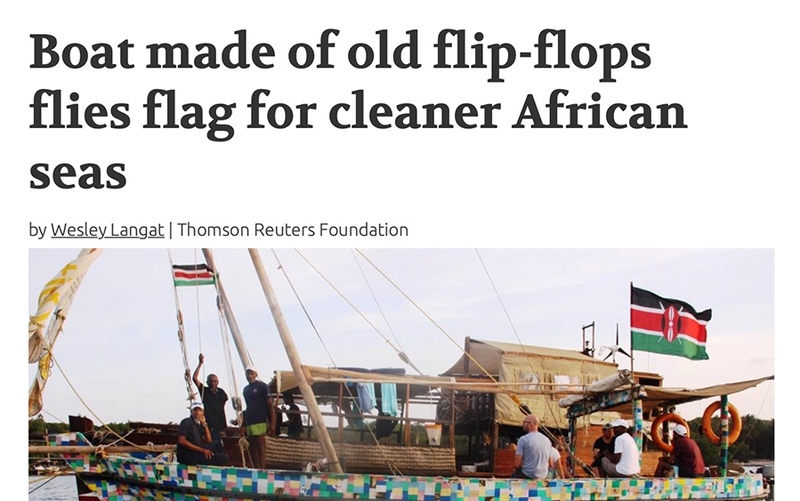 Preparations for The Flipflopi Expedition are on at a Lamu beach, where waste plastic and discarded flip-flops collected from Kenyan beaches and towns are being used to build a 60 foot boat that is destined to sail to Cape Town. 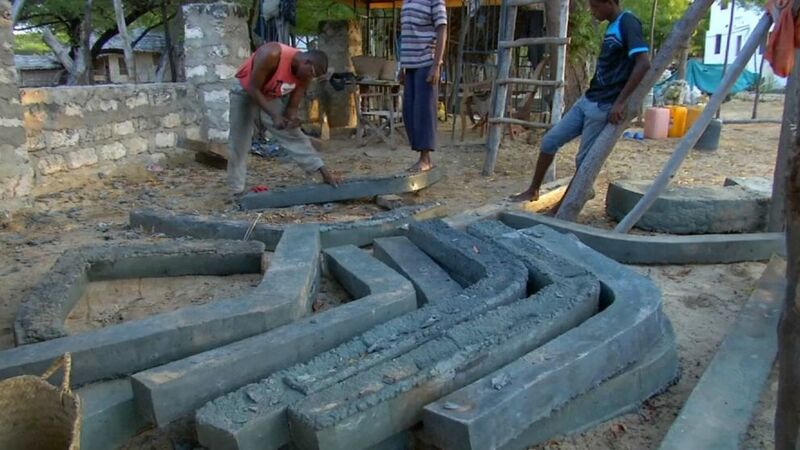 A Malindi based plastic waste company is set to build the first ever dhow made with recycled plastic and discarded flip-flops at a cost of 60 million shillings. In the second issue of Nomad Magazine, we bring you our pick of private houses and explore the charm of Lamu Island with its distinct culture and rhythm that is quite unlike anywhere else on the Kenyan coast.